I am a member of the Collective Bias® Social Fabric® Community. This content has been compensated as part of a social shopper amplication for Collective Bias and its advertiser. I know, I know. All these recipe posts recently! I have no idea whats happening either. I do want to set one thing straight though..... I honestly can't cook. As I've been sharing more foodie posts over the last couple of months, lots of you have commented on how I must be able to - but I really can't! I'm learning, yes, and I actually enjoying cooking these days, but I guarantee that every recipe you'll ever find on here is suitable for complete and utter novices (like me). 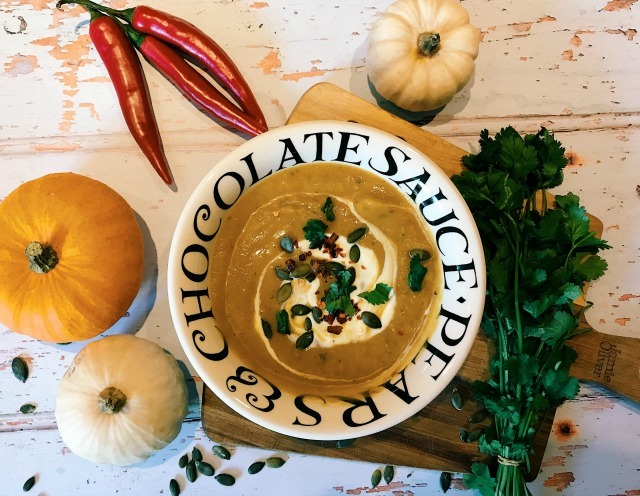 Now I've got that out of the way, I would like to share a ridiculously easy and insanely delicious recipe for spicy butternut squash soup with you today! 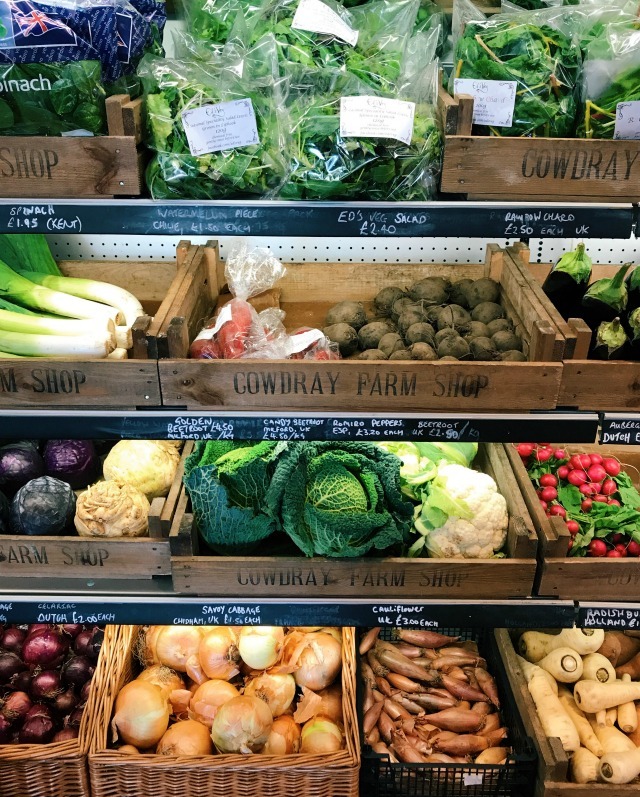 I spent yesterday at one of my all time favourite food shops - Cowdray Park Farm Shop in Midhurst. 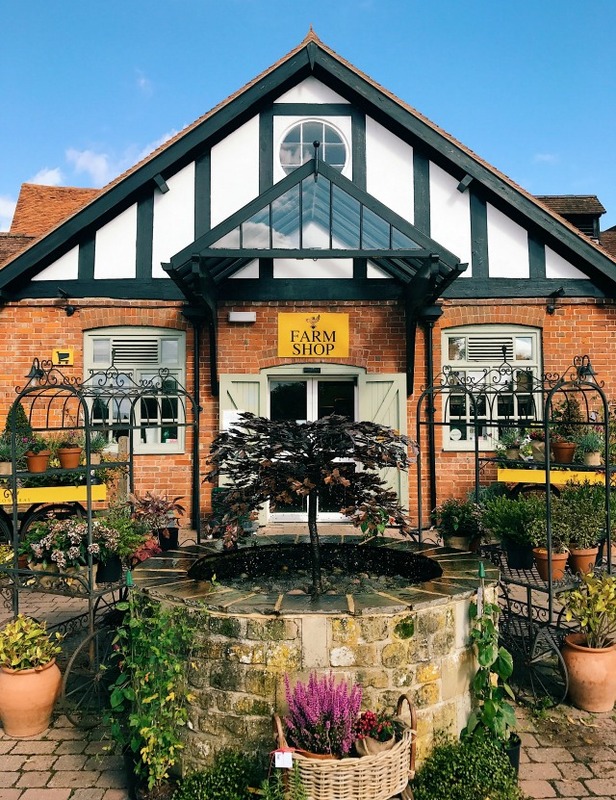 If you live nearby or fancy a little road trip out to Sussex I would definitely recommend paying Cowdray a visit - you can easily make a day of it while you're there. First up, there are the ruins of Cowdray House to explore - with a lovely walk to them from the car park, past the Polo Club, with a hella lot of blackberries to be picked along the way. Then there's the Cafe, which sells the most amazing ice cream (yes, even in this weather) and fresh juices, as well as sandwiches and hot meals. And THEN, there's my favourite bit of all - the farm shop itself. 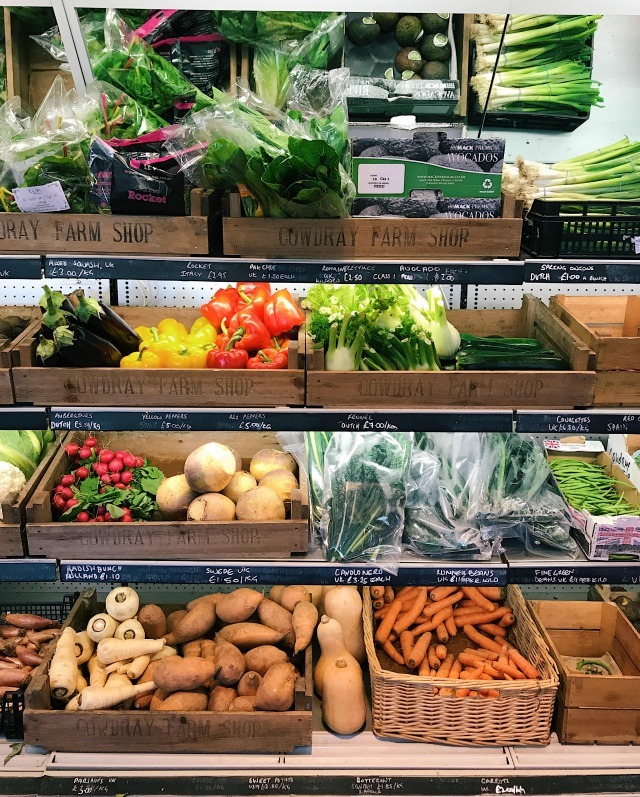 Selling all manner of local produce, every shelf is bursting with colour and, I don't know about you, but that makes me want to buy EVERYTHING! On this occasion I was here to stock up on vegetables to make my soup, although you won't be surprised to hear that some Montezumas chocolate and a bottle of Blackdown Gin fell into my shopping basket too. I absolutely love soup at this time of year (along with woolly hats and PUMPKIN SPICE EVERYTHING!) and often have it as a comforting evening meal, served with a wedge of crusty bread. Now that the girls are both at school and eating a large meal at lunchtime I've been trying to add some light, healthy suppers like soup to my repertoire. 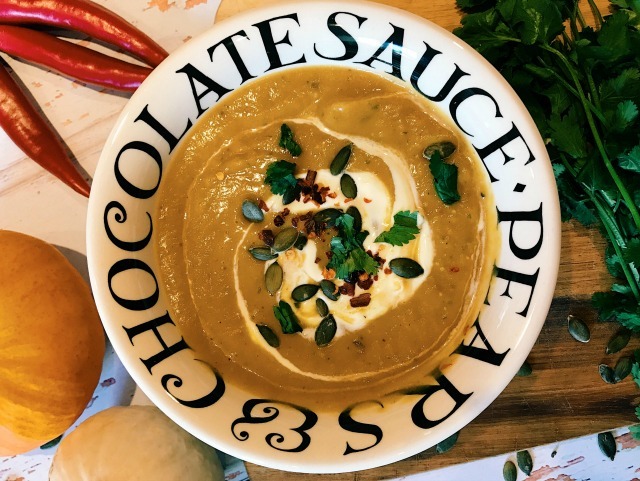 The best bit about soup is that it's SO easy to make, can be pretty darn healthy if you pack it full of veggies - and it's also a great way to use up any veg in the fridge! Preheat the oven to 200degrees. Chop the butternut squash and onion into cubes of roughly 1cm. Place on a baking tray along with 6 unpeeled/chopped cloves of garlic, a small sprinkling of chilli flakes and a glug of olive oil. Shake to coat. Roast for 45 minutes, shaking the tray half way. 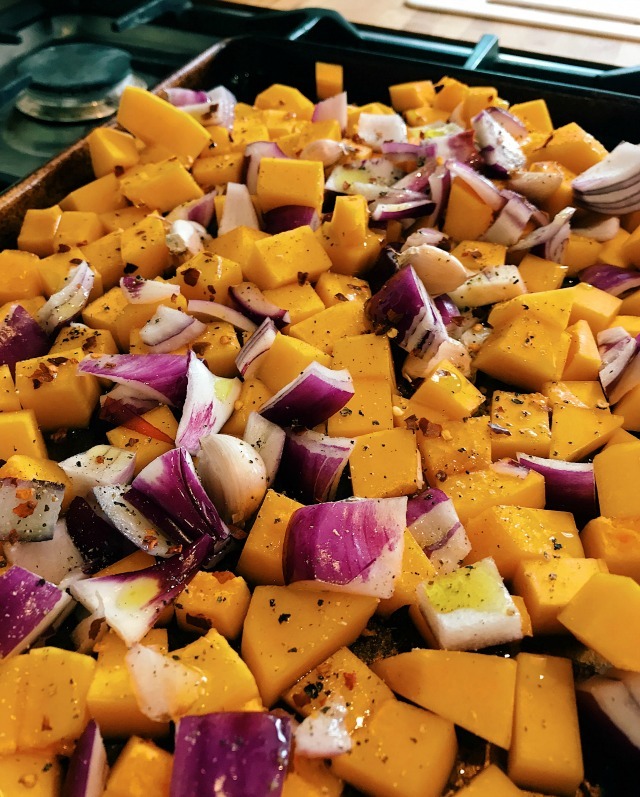 I find that roasting makes the squash taste so much sweeter than when it's boiled or baked! Once the veggies have softened, leave to cool for five minutes, remove four or five of the garlic cloves (dependent on your tastes!) before transferring to a blender. Add the stock and a small bunch of coriander. I also added a few pumpkin seeds as I'm obsessed with them at the moment! Stir in a dollop of creme fraiche* and garnish with fresh coriander, a sprinkling of pumpkin seeds and a pinch of chilli flakes. Serve with fresh crusty bread and salty butter* and enjoy! *Optional - leave these out to make this soup entirely dairy free.